Dorries has published a series of claims about me in this post on her not-really-a-blog. To describe it as “70% fiction” would be putting it rather too kindly. On Monday, the Sky Boulton blog, not only ran a negative and imbalanced story, it legitimised the very person the Police advised me to disguise my movements from, Tim Ireland. I’m sure, the article, that she doesn’t link to, contains too few commas, for her liking, but it can be found here. Nadine Dorries is using false accusations of stalking to excuse lies she told her constituents long before I blogged about her. Even if I have secretly invented time travel (and I’m not saying I haven’t) she told the Commissioner that she gave a false impression that she was mainly resident in the constituency to “reassure” her association and constituents. Even if I have travelled back in time to retro-stalk Nadine (and I’m not saying I haven’t), never at any time have I acted in any way that could give police cause to advise Nadine Dorries to hide her movements from me as she describes. In fact, the only time we have ever been in the same room was at a public event for candidates and constituents. Constituents invited me to that event. Dorries has previously sought to use my presence at that event as her sole excuse for describing me as a stalker at that same event (and claiming I was the subject of a related police investigation at the time). It’s not only a lie, it’s an old lie. Not only has this man stalked me, he can telephone my constituency office so many times in a morning, the staff disconnect the phone, making it impossible for constituents to make contact. I have not stalked Nadine Dorries. What she implies about a nuisance calling is entirely false, even in this vague state. It’s especially insulting that her embellishment aims to portray me as an enemy of democracy standing between her and her constituents (and not for the first time). He never telephones the London office. He possibly suspects those calls would be recorded. For some reason, Dorries added this the morning after she first uploaded this article. She needn’t have bothered. It’s garnish. FYI, I called the number provided for the office of the Mid Bedfordshire Conservative Association, in an attempt to resolve this without talking to the hysterical Dorries or any of her staff/daughters. I had no intention of speaking to her constituency office, but it appears the two are indivisible. I have reported him to the House of Commons police on three occasions and the Chief Constable of Bedfordshire Police explored the option of triggering section 5 of the Public Disorder Act. Reporting someone for stalking does not make the subject of your claim a stalker. If police thought there was anything in what Dorries claimed about me (there is no knowing at this stage how much of what she told them is/was fiction or things she is/was very confused about), then they would have been in touch long before now. But at least, after months of asking Dorries to put a number and/or officer name and station to her claims, I know enough to make contact with Gillian Parker, Chief Constable of Bedfordshire Police. If Gillian Parker or any other officer did explore “triggering section 5 of the Public Disorder Act” as Dorries claims, without talking to me about it, then they must have concluded that there wasn’t sufficient evidence of an offence taking place, and/or that my conduct was reasonable. What this smells like is Dorries using her position of power to kick it all the way upstairs so the most senior officer available had to explain this to her. The House of Commons Police informed me that Mr Ireland had actually rang their office demanding to know if he had been reported. He had and they were seeking advice from the Met harassment unit. This was also added after the original article was uploaded. It appears to be based on my account rather than anything told to her by the ‘House of Commons police’. If only she would put some specifics to what she claims. Perhaps while Dorries is mouthing off she’d care to stipulate on which dates she made complaints to police about me, what specifically she claimed I was responsible for, and who she spoke to about this, at which station. I run one Twitter account that satirises Dorries. There is a secondary account for a super-powered foetus that is part of this same joke. Either Dorries believes I am behind every Twitter account that mocks her, or she is deliberately misrepresenting the scale of my activity. Again. There is a blog that documents her worst outbursts, and I dared to mock her on YouTube. I’m cross-platform. Using free third-party platforms, this necessitates provider-specific accounts. Dorries is totally misrepresenting that. … and the very odd, obsessive nature of his writing to understand why I was given the advice I was. I would dare to describe this passage as bordering on the subjective. Dorries thinks a 21-week-old foetus can punch its way out of an incision in the uterus, but my questioning the detail of her claim makes me obsessive in her eyes. Oh, and the advice she speaks of (even if it was anything like she implies) is a false excuse for lies she told long before I even knew of her, as I have already mentioned. Sorry if that attention to detail creeps you out, by the way. What he writes is aggressive, untrue, disturbing in it’s intensity. Another ‘morning after’ sentence. And it’s garnish, too. During the election, he travelled to my constituency from Surrey by train, [not an easy journey], laden with computer and camera equipment, lied to the organisers of a public meeting about who he was in order that he could get close to film me. Note how she lays this down after earlier implying that I had been following her around to the extent that she had to mask her movements (something she cannot possibly hope to prove because it never happened). It’s beyond obvious; it’s childishly pathetic. Isn’t anyone on hand to give her proper guidance on this? Even if she expects to get away with libel on the basis of her assumption that her target(s) dare not sue her, she looks like a petulant, vindictive child, attacking people with accusations that have already been proven false and using excuses that were wholly discredited days ago. “Laden with computer and camera equipment” we can put down to poetic licence (along with the far more contentious flair of my wanting to “get close” to her). She also later added that this was “not an easy journey”, but it was a doddle. As for that public meeting, I was invited. I most certainly did not lie to organisers about who I was, or why I was there. Dorries did not witness this event, but I can produce people who did. Further, the organisers have recently gone on record as not remembering the event in quite in the same way that Dorries does. He then supposedly lied to the organisers of a public meeting about who he was, in order that he could get close to film me. I hope to say more after being in contact with those same organisers, assuming Dorries continues to stand by her (now softened) lie that I lied which she is using to push her lies about stalking, which she is using to excuse the lies she said* she told to her constituents. In case you haven’t worked it out yet; Nadine Dorries says these things because she is worried about being thoroughly exposed as a liar. I am not the only person he has harassed and stalked and when I spoke to a well known law firm about him recently, he was well known to them. For something completely different. Pfft! She can’t possibly swing ‘known to police’, so she tries ‘known to lawyers’. Her hatchet jobs are getting increasingly low rent. I’ve only ever had cheap threats and cheap tricks from those lawyers who don’t remember me fondly. Even if we assume there’s any truth to the story behind Dorries’ dark implications, so what? Further, a lawyer is not a policeman, but a man who knows the law and works for hire. And if one of them had evidence that I had broken the law in any way, then they would have little difficulty getting that across to a policeman. I’ve yet to receive any letters from any lawyers claiming to act on behalf of Dorries, BTW. The Sky Boulton blog was outrageous and distressing. John Craig, their political reporter felt there was nothing wrong in legitimising a man I and other MPs have felt the need to report to the Police. If any other MP has reported me to police about anything, I have yet to hear about it, and when it’s serious they tell you about it. Dorries earlier claimed that I stalked Anne Milton to the extent that police had to get involved, but the truth is that the police investigated one of Milton’s activists. Anyone can call Anne Milton’s office and ask. She won’t be able to deny it. I have never been the subject of a police investigation as Dorries implies here and has claimed elsewhere. I have never even received a friendly call from a policeman who might be a little worried that I am overdoing it with Ms Dorries or anyone else. Even when using characters/satire, I have always blogged in a way that makes no secret about who I am, and if Dorries had made a complaint of any credibility and substance to any officer anywhere in the land, then the police would have been in touch with me long before now. 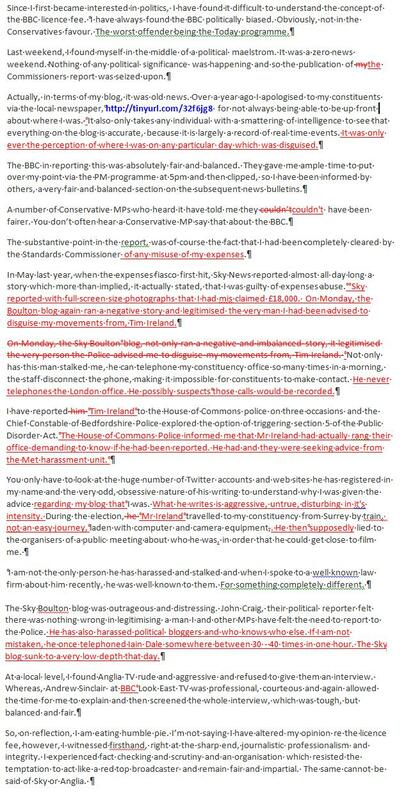 Dorries is a liar who knowingly uses damaging falsehoods about her perceived enemies, and here is the detail in my case. In May of this year, Dorries claimed a police investigation was underway into my activities. If there is any truth to this, then Nadine Dorries should be able to produce at least one relevant crime reference number. If any journalists get in touch, I’m happy to provide the relevant crime references numbers that verify what I claim. Dorries is not. Nadine Dorries is a liar. A corrupt liar, to be precise. UPDATE – Nadine Dorries is a Liar and Unfit to Hold Public Office, a post that seeks to dig some sense out of Dorries’ claim that a Chief Constable “explored the option of triggering section 5 of the Public Disorder Act”. 9 Responses to "Dorries is making it up as she goes along"
Only stalkers back up everything they put forward with sources, links and facts. Ergo, you're a stalker. You stalker. What? Some lawyers have heard of you! How can you possibly continue to keep up this charade of integrity in the face of such damning evidence?? This is all very weird. I haven't been following everything in detail up to this point, but it appears you're keeping your head in the face of utter insanity. Good luck. The words 'bang to rights' spring to mind. What I like about this post is that she can prove you wrong in the courts if she so desires. She can clear her name by suing you; let’s see if she does, eh? Do you remember that Fawlty Towers episode with the psychiatrists? At the end one of them says: "There's enough here for an entire conference". I particularly enjoyed the fact that one of the indicators you are a bad sort is your use of public transport. Oh and you don't think by any chance the "well known law firm" is Donal do you? I understand this is probably not quite as amusing for you as it is for the rest of us. The blog is of course plainly defamatory. No doubt you'll find someone to take it on as a conditional fee. You can probably round up a left wing blogger to go round with a camera and serve it. Every day a politician sinks to lower depths of depravity. Sounds like she needs to get a grip on reality, what a monster.